Railways 1914-1918 is the latest travelling exhibition from The Workshops Rail Museum, Queensland Museum Network. It explores the role of railways at home and on the front and the pivotal role of rail in moving Australia’s military. It has been adapted from the original exhibition and includes nine large pull up banners and a purpose built crate/show case for travelling and displaying replica artefacts and ephemera. Plans to display it in regional Queensland began in March this year when south east Queensland MDO Josh Tarrant undertook to develop a travelling schedule. FNQ’s MDO Jo Wills was keen to give far north Queensland’s communities the opportunity to host a QM travelling exhibition and agreed to help out. Last week, Josh and Jo travelled west to Normanton to install the exhibition in it’s first venue – the sensational heritage listed Burns Philp Building which was constructed in 1884. Now used as the Visitor Information Centre, Library and for community markets and events, it was the perfect place to kick off the tour. The MDOs used this western journey as an opportunity to catch up with communities in Georgetown and Croydon along the way. They also spent some time at the small museum at Normanton Railway Station, home to the iconic Gulflander. It’s rather fitting that the Gulflander will contribute to the exhibition’s journey east. After being on display for a month, the exhibition will travel to Croydon on the Gulflander, thanks to the generous support from the Officer in Charge, Ken Fairbairn. It will then travel onto Georgetown by road. Etheridge Shire’s TerrEstrial Centre at Georgetown will host the exhibition in September. From there the exhibition heads east to the Mareeba Heritage Centre in October before heading down to Cairns Botanic Gardens Visitor Information Centre in November. After a short break over the Christmas period, it will be on display in Atherton’s Post Office Gallery in February before making one last journey to Port Douglas in March. My Grandmother-in-law, Clementine Manning, gave me an Autograph Cloth. 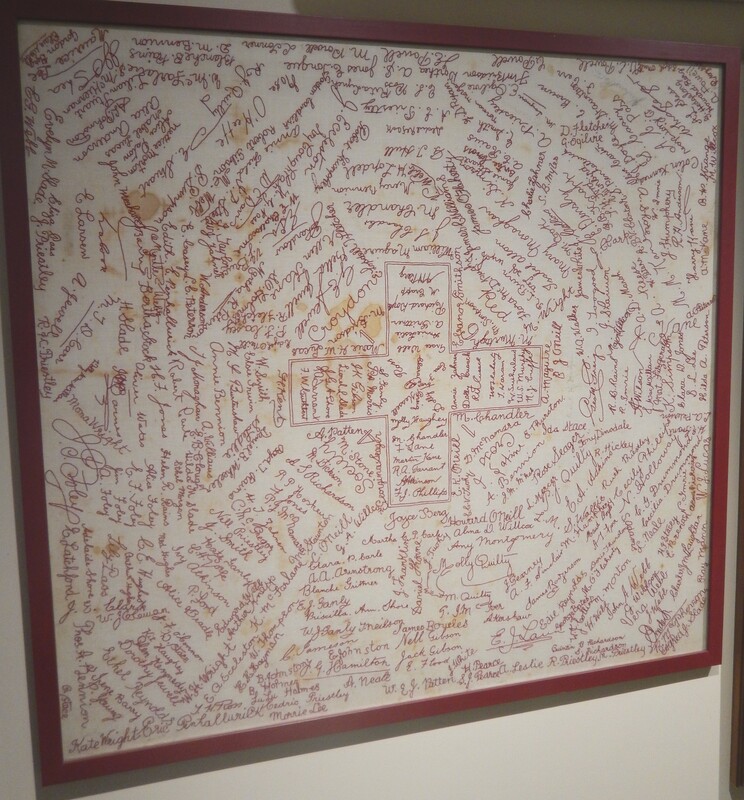 In the centre of the cloth it says: “KINGSBOROUGH AUTOGRAPH CLOTH – IN AID OF BELGIANS – OCTOBER 9th 1915” It is surrounded by appliqued signatures of the children at the school in 1915. 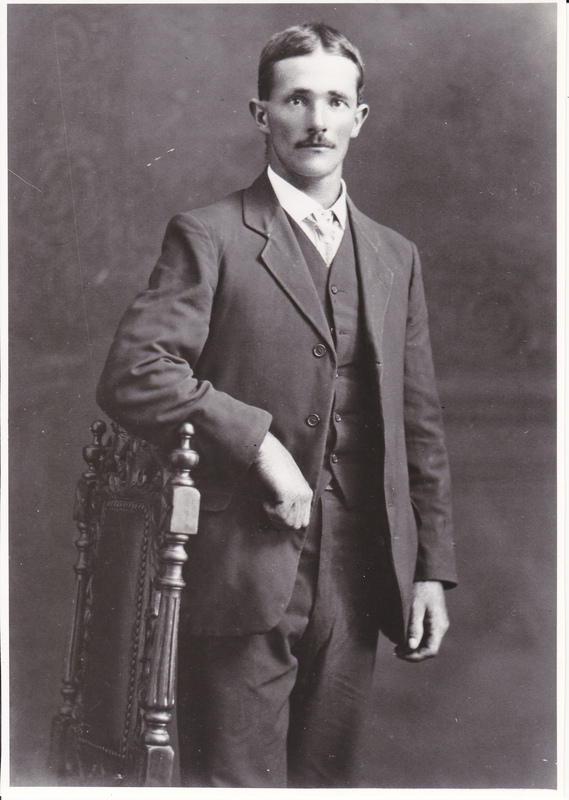 One of them, Vincent Manning, is my husband’s great uncle. Kingsborough Autograph Cloth – In Aid of Belgians October 9th 1915. To say I was interested was an understatement! What a treasure! And so the process of research and object analysis begins. Reports of atrocities committed against Belgian civilians—actual, exaggerated and invented by British propaganda—flooded newspapers around the world. I found specific postcards were generated to support this, particularly in Britain. 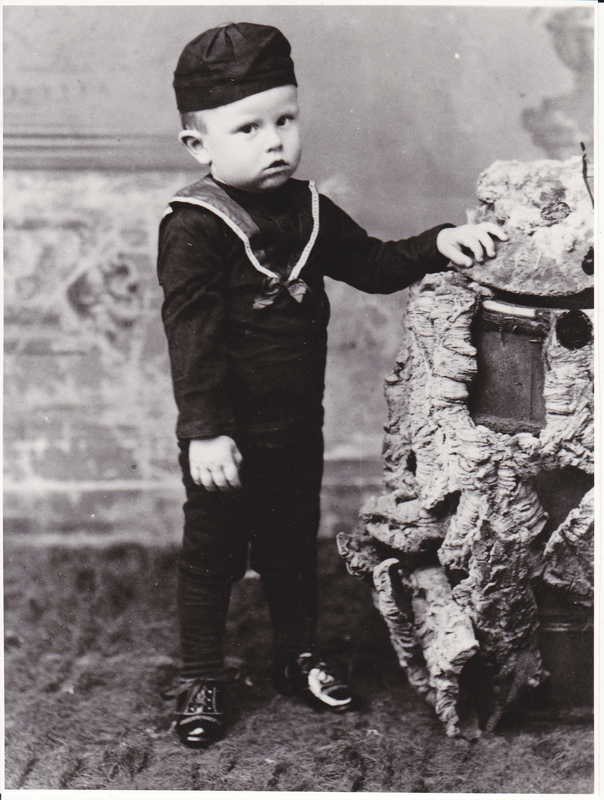 I also found a number of collections with specific material about the Belgian Relief Fund, in the State Library of New South Wales, the State Library of South Australian and the National Library of Australia. But what of Kingsborough, and Queensland? In 1915, Kingsborough was a small mining town on the Hodgkinson goldfield in the hills behind Cairns and Port Douglas. Pugh’s Almanac reports it had a baker, blacksmith, butcher, aerated water manufacturer and two hotels – the Federal and the Kingsborough. 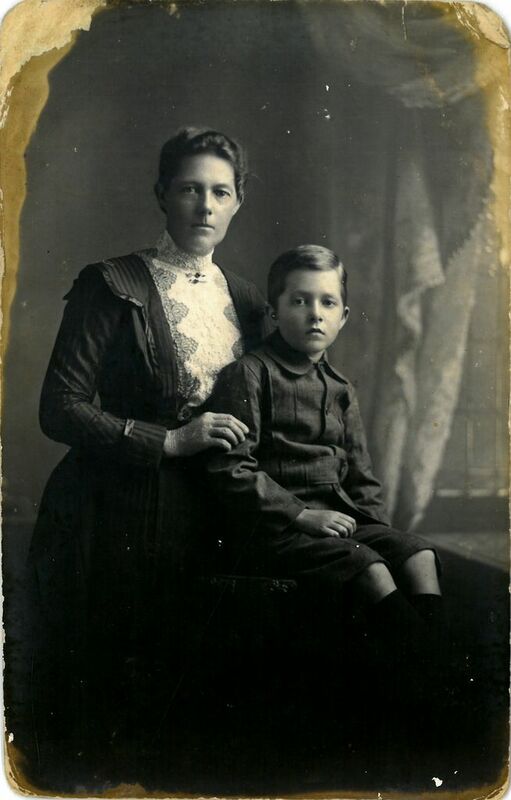 Children were taught at Kingsborough State School No 359 by the teacher Ms Amelia Boyns. It is through Amelia Boyns that we start to uncover more about the story and fundraising in the region. In January 15, The Telegraph reported that Amelia donated the proceeds of an autograph cloth (1 16 shillings) to the Belgian fund which were disposed of by the art union. It also notes she ran a guessing competition for a doll, raising 16 shillings and putting that towards wounded soldiers. In September 1915 the Cairns Post reports that she sold a boy’s hat for 1 eight shillings and six pence and put that towards the Belgian Fund as well. I’d love to spend more time researching Amelia’s history. She appears to have been a motivated and passionate supporter of the war effort, and another example of the type of activities that women undertook on the home front. She left Kingsborough in 1916 and moved to Edge Hill in Cairns to teach. Unfortunately, however, that is as much time as I could sneak away from other projects and indulge in a bit of research. I can report, however, that the cloth will be donated to the Historical Society of Mareeba. But as we sat and discussed the projects and their merits, I wish, in hindsight, that I had reflected a little more on what aspects of the projects didn’t go to plan or experienced hiccups. I am the first confess that the delivery of some of my projects encountered speed humps and that we had to make changes and deviations along the way. It’s rare that we speak publically about mistakes or hiccups – but I find these are the very things that provide invaluable learning. If we shared these experiences more readily with some of the other groups undertaking projects we might help them avoid some of the issues we have encountered. I was also aware that the projects I discussed are but a few of those that have been produced locally, and that one of the legacies of this extraordinarily busy period of history making was the skills and contributions of museum and historical society volunteers. In far north Queensland, Cairns Historical Society, Mareeba Historical Society, Mareeba Shire Council, Cairns Regional Council, Douglas Shire Historical Society, Loudoun House Museum, Mount Garnet Visitor Information centre, Cooktown History Centre, to name just a few, have all delivered a range of exhibitions and events that provide a distinctive far north Queensland take on the First World War and involved people in undertaking historical and museum based work. Don Lawrie, Mulgrave Settlers Museum, Gordonvale. Image: Matt Finch. Fortunately, the Heritage Leaders Workshop gave participants an opportunity to see projects from across the region, and also appreciate the different sort of people involved. 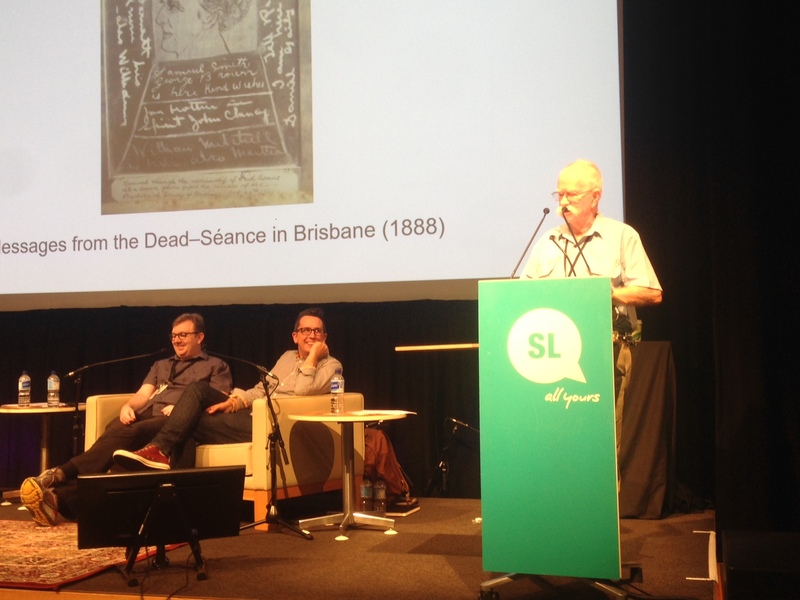 Far north Queensland was represented by volunteers from Mareeba Heritage Centre, Douglas Shire Historical Society, Atherton Library and Mulgrave Settlers Museum. Ken Keith spoke about the Douglas Shire Historical Society’s Douglas Diggers WWI Project. During one of the workshops, Don Lawrie from the Mulgrave Settlers Museum took the stage and entertained the audience with his storytelling and object based remembrances. I think it is this personal involvement, and the satisfaction that people glean from it, that lies at the heart of these projects’ success. Cooktown’s War: final exhibition in one of the nun’s cells at James Cook Museum, Cooktown. Photo: Ewen McPhee. Like many museums across Queensland, James Cook Museum received funding from the Anzac Centenary Local Grants Program. Designed to showcase the museum’s First World War collections, the grant also included time for Ewen and I to provide onsite advice, reconfigure the gallery space and install the exhibition. When Kate Eastick took over the reins as the museums new curator, however, she decided to refocus the exhibition to tell stories from the home front and the local community, and identified a different space for the exhibition. This change responded, in part, to some of the stories and objects Kate uncovered during her research. An unexpected find, for example, was a hand crocheted square (pictured below). She was also keenly aware of Cooktown History Centre’s Behind the Lines Exhibition, which provides detailed biographies of Cooktown’s soldiers and their wartime experiences. Cooktown’s War creates an additional narrative layer to Cooktown’s war stories and reveals the impact of the First World War on Cooktown residents. And by working with members of the History Centre, the exhibition demonstrates the benefits of two of Cooktown’s premier collecting organisations pooling resources and knowledge. Shared photos and research have meant that details about rifle clubs, and Chinese business owners and war loans have been placed on display. Difficulties surrounding Indigenous enlistment are explored through archives and portraits of Charles and Norman Baird, brothers who were among Queensland’s Indigenous soldiers from the region. Stories of Red Cross fundraising initiatives and women’s patriotic activities have been woven into the exhibition framework through evocative photographs (see below). Kate also included a contemporary story using a uniform and images from the 100 years commemorative march held in Cooktown this year. Cooktown History Centre’s self funded First World War exhibition,” Behind the Lines.” Photo: Jo Wills. Bev Shay and Marge Scully, Cooktown History Centre, 2015. Photo: Jo Wills. Female patriotic group wearing fancy dress at Cooktown, ca.1913. 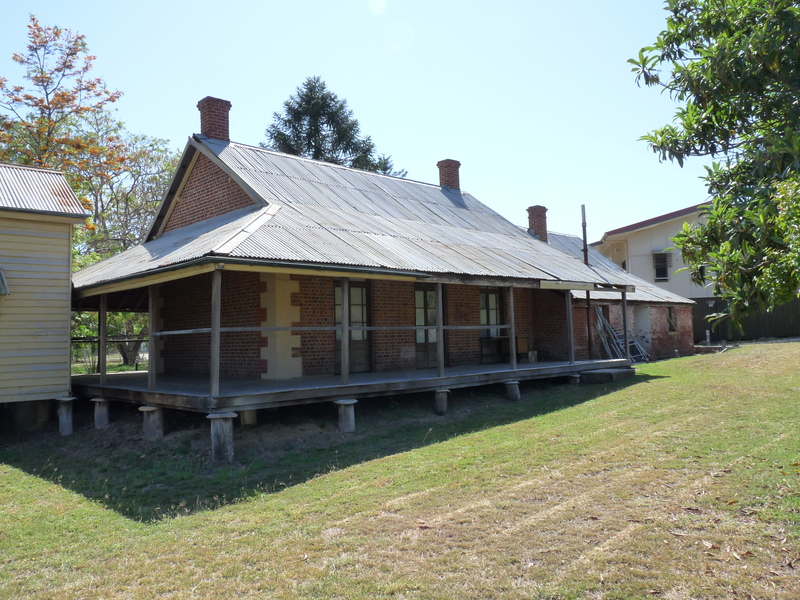 Image: Cooktown History Centre. Crocheted square – “Success to the Allies”. Collection: James Cook Museum, Cooktown. Photo: Jo Wills. Cooktown Honour Board, Collection: James Cook Museum, Cooktown. Photo: Jo Wills. 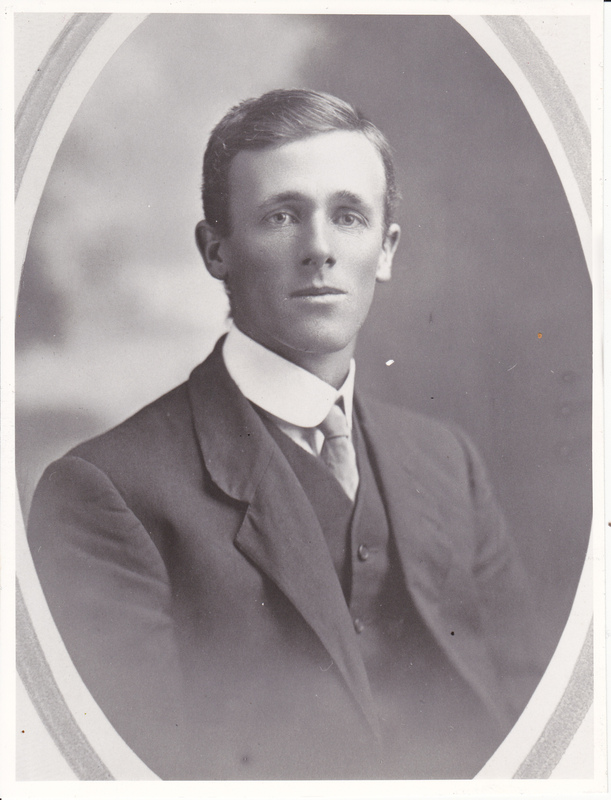 Private Charles Baird. Image: John Oxley Library, State Library of Queensland, 11 December 1915. 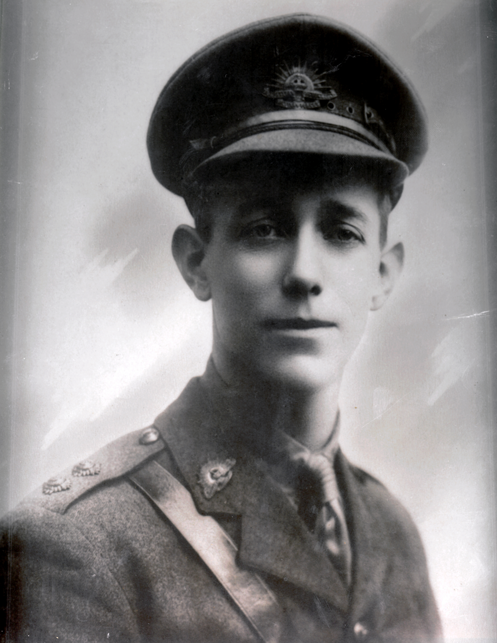 Private Norman Baird. Image: Australian War Memorial. Private Walter Spearritt, Certificate of Discharge. James Cook Museum. Changes to the project meant that Ewen and I also had to make adjustments. The alternative gallery space meant Ewen had to install a new hanging system and different types of framing mounts and matts were required. By coincidence, Cooktown’s timber honour board, already on the display, is located outside the gallery. This, and a poster created to promote the exhibition, created a nice entry to the gallery. I had to remove some photos and posters from damaged frames for conservation and display purposes. I also made a range of different mounts and object supports, and generally extended my sewing skills! Of course, label making is always a feature for this type of project, but I can advise that the degree of difficulty definitely increases as the temperature and humidity rises! MDOs have to be fairly versatile and responsive whilst in the field. As James Cook Museum had recently had a serious pest issue in its Indigenous display cabinets, we took time out from the exhibition to reline the cases with unbleached calico and then reinstall all the objects that had been treated prior to our arrival. Ewen McPhee framing inages for the exhibition. Photo: Kate Eastick. Jo Wills making a mount for medals. Photo: Kate Eastick. Kate Eastick installing the Rossville Rifle Association Trophy. Photo: Jo Wills. Jo Wills, Kate Eastick and Ewen McPhee at the front of James Cook Museum. Photo: James Cook Museum. Relining cabinets with unbleached calico. Photo: Ewen McPhee. Indigenous artefacts reinstalled. Photo: Ewen McPhee. Recently Queensland Museum staff Ewen McPhee, Dr Melanie Piddocke and Sue Valis visited Bowen Museum and Historical Society to work with the volunteers on their First World War display. As with many community museums the First World War objects and stories that are held within the Bowen collection are significant on a National, State and Local level. This trip was undertaken to install some display furniture and to train the volunteers in object mounting, display planning and basic conservation practices. Research was also done for the next phase of exhibition development which includes text panels and object labels. Are you Anzac-ready? Or busy working on an Anzac-related project? As museums and historical societies across the state continue preparations for a suite of Anzac projects for the 100th anniversary of the landing at Gallipoli, let’s take a sneak preview of a project underway in far north Queensland. Anzac Treasures from the Tablelands is collaborative exhibition between museums, historical societies, libraries and visitor information centres from the Tablelands Heritage Network. They are working with the FNQ MDO to pull together and curate the exhibition. It is funded through the Federal Government’s Anzac Centenary Local Grants Program in the Kennedy electorate, via the Friends of the Atherton Chinese Temple, and with the support of Tablelands Regional Council. The exhibition aims to highlight the work volunteers do to protect the districts heritage, as well as commemorate the First World War and its impact in the region. Part of the project has involved the volunteers participating in a series of exhibition workshops which explore the process of putting an exhibition together – from developing a concept and identifying objects to organising space and writing labels. Over the next few weeks, groups will be busy framing images, finalising labels and preparing their contributions prior to installation and the exhibition opening. This is the first collaborative exhibition the Tablelands Heritage Network have worked on together. It has been a lot of fun, as well as an informative and engaging process. Participants have been sharing resources and ideas, and comparing their own local knowledge of this topic and the region during the war period. 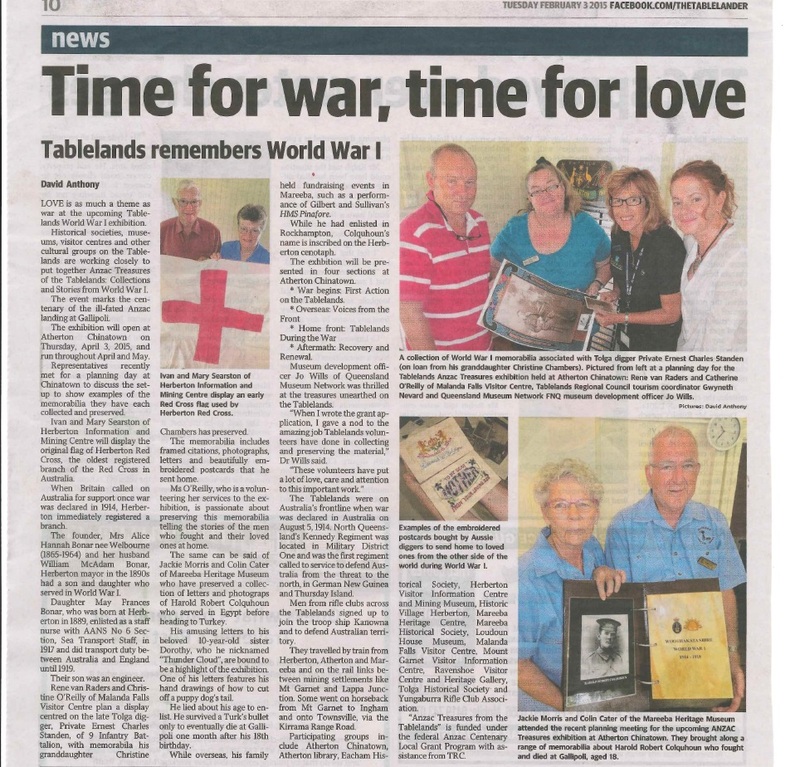 At a recent workshop, volunteers presented a range of objects for inclusion in the exhibition, some previews of which are included in this article published in a recent edition of the Tablelander newspaper. Click on the newspaper to read. Helen Kindt and David Foster with the first box of rehoused glass negatives from the “Portraits of the North” project. 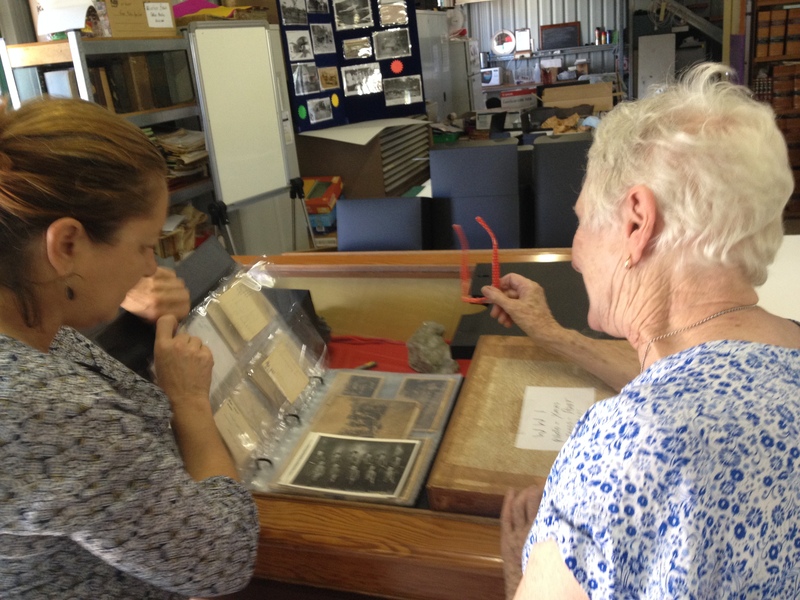 Last week, volunteers at Mareeba Historical Society worked with Queensland Museum Conservator, Sue Valis, and FNQ MDO, Jo Wills, to conserve their First World War related collections in a project called “Portraits of the North”. Funded through the Queensland Anzac Centenary grants program administered by the Anzac Centenary Coordination Unit, Department of the Premier and Cabinet, the project was designed by the MDO program and the Historical Society to preserve, protect, present and promote the legacy and stories surrounding their significant collection of glass plate soldier portraits and associated First World War artefacts. And, what a collection it is. The glass negative portraits illustrate the youth and vigour of enlistees before they left to serve their county overseas. 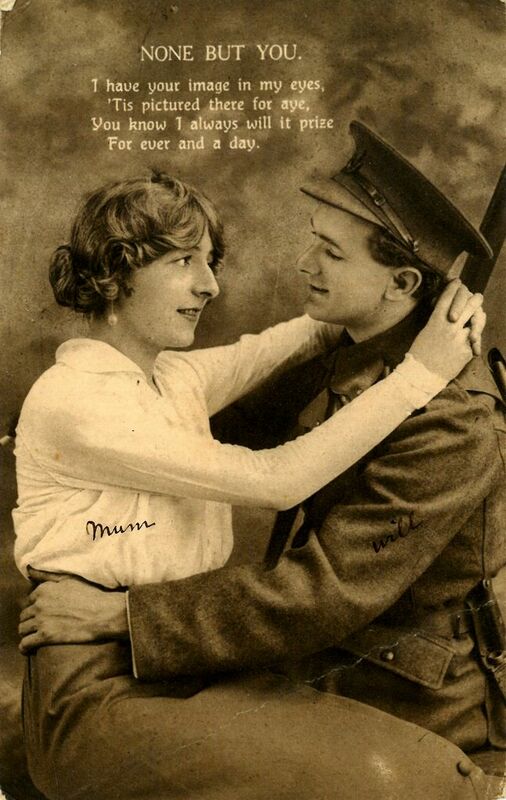 Postcards and letters home reveal the personal impact of service, and the ways in which soldiers and nurses communicated with loved ones at home. Other glass negatives document scenes from front, enlistment posters, musical scores and stories from war correspondents. Additional items include a dressing bandage, a soldier’s belt, a Dead Man’s Penny, war medals, silk cigarette cards with military insignia, and photographic albums. Boxes of glass negatives that needed to be rehoused. Rehousing the glass negatives – acid free card pockets and foam-lined archival boxes. After an initial assessment of the conservation needs and priorities, Sue and Jo worked with Helen and David to protect and rehouse the glass negatives. A project that the Society has wanted to tackle for over 15 years, the process of making individual pockets for different sized glass negatives and lining storage boxes with protective foam was time consuming and repetitive. However, now that the work is finished, the collection will be better protected into the future. Sue also undertook specialist conservation and rehousing of some of the Society’s First World War artefacts. 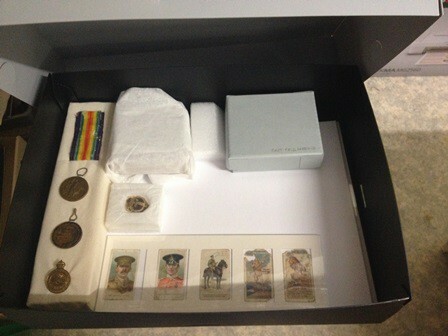 Some of the items, including the silk cigarette cards, the soldier’s belt and the medals have had been conserved in such as way as to make them easy to display in the Society’s four up coming exhibitions in 2015. Rehoused silk cigarette cards – protected storage and display solutions. Conserved artefacts stored in archival box. Sue shows Helen an archival album for cards and photographs. Having two Queensland Museum staff work intensively onsite on specific projects has a lot of benefits for communities and volunteers. It provides them with access and exposure to a range of conservation skills and training, and to discuss future projects with the MDO. But communities are not the only beneficiaries. Through these types of project QM staff can extend their skills and understanding of materials, objects and historical research, thanks to the expertise and generosity of volunteers. 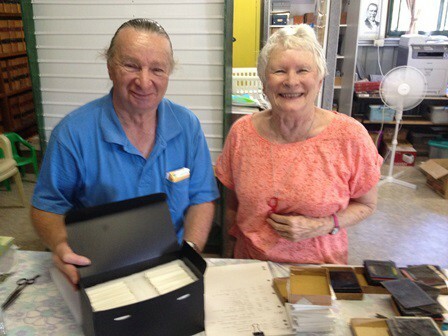 Whilst working on the conservation project, Jo also worked with Helen, David and Carol to identify appropriate collections for use in another Anzac project being undertaken on the Atherton Tablelands, as well as discuss a range of other projects and issues that the Society aspires to achieve. “Portraits of the North” was made possible thanks to a grant by Queensland Anzac Centenary Grants Program, through the Anzac Centenary Coordination Unity, Department of Premier and Cabinet.